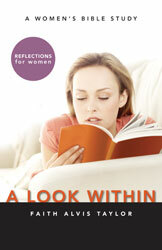 Join Faith Alvis Taylor in an interactive Bible study that takes A Look Within the lives of eleven women of the Bible. In what they thought, did, and said, these women revealed the nature of their characters, directly affecting those around them for good or ill. By learning from their failures and successes, Christian women of all ages find practical biblical principles that apply to the daily Christian life. Step-by-step Bible study and practical, spiritual application draw out valuable lessons from God’s Word for women today and make A Look Within ideal for discipleship and personal or group devotions.